The SINAMICS V20 Smart Access is a web server module which mounts to your SINAMICS V20 quickly and easily. In providing a Wi-fi based hot spot, the wireless connection transforms your mobile device or laptop into a virtual operator panel. 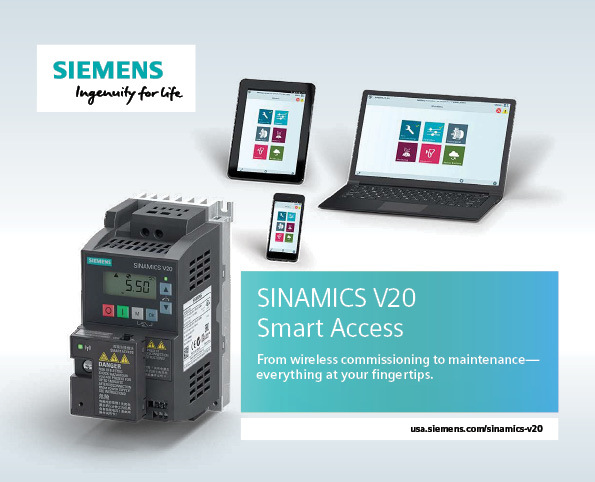 The simple embedded graphical user interface (GUI) makes it extremely easy-to-use the SINAMICS V20 drive in every phase of operation—from commissioning, operation, diagnostics and maintenance. No separate app is necessary, nor is a written instruction manual needed—operation is very intuitive. This entry was posted in News on 18th May 2017 by GerASI.